We spent our last weekend of summer break in the mountains with my husband’s family and I’m happy to report that we found plenty of gluten-free restaurants in Breckenridge and Frisco. 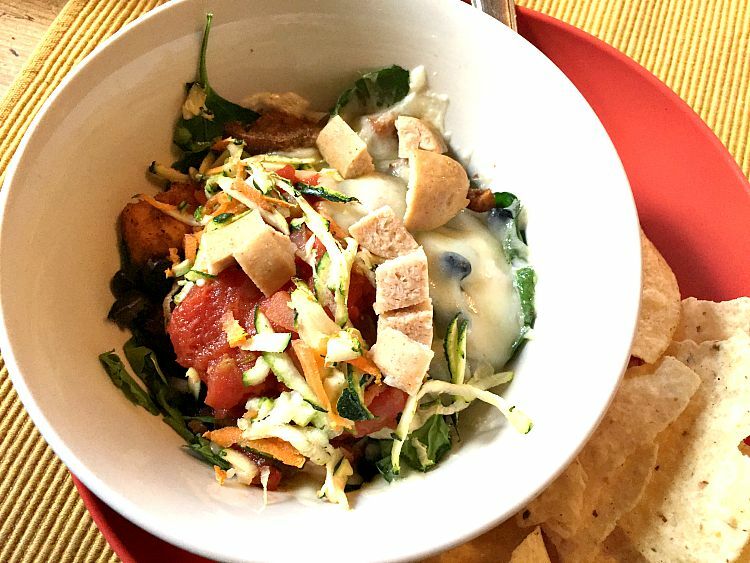 If you’re visiting Summit County and need a go-to gluten-free restaurant in this wonderful mountain town, give these gluten-free joints a try! Amazing Grace on Lincoln: Amazing Grace is a quaint sandwich shop just off Main St. in Breckenridge. 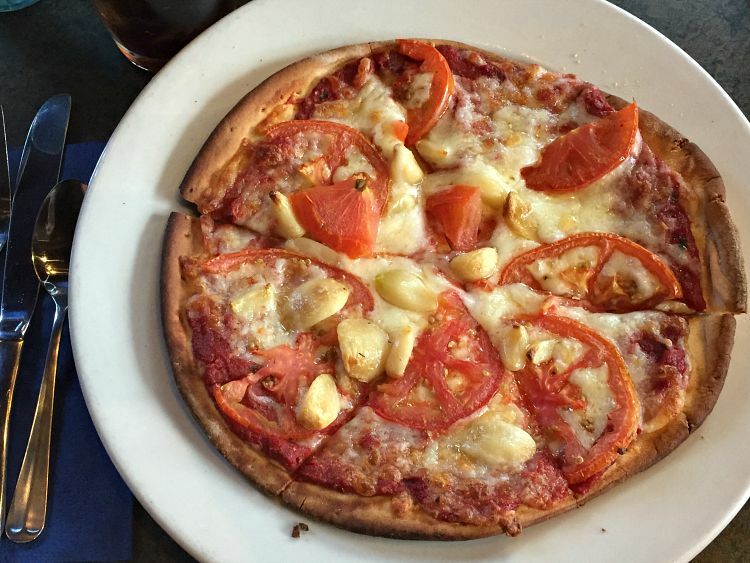 The restaurant boasts an all natural menu with plenty of gluten-free options. The cozy location and mismatched tables and chairs made us feel like we were in another place and time. The server was knowledgable about the gluten-free diet and offered up several suggestions. I chose the burrito without the tortilla wrap (see picture below). I must say, the dish was oh so yummy. My only qualm is that the portion was super tiny. I was still hungry. I asked for chicken sausage along with my burrito and they added one tiny sausage. Pathetic. Regardless, I felt wonderful after eating there (just a little hungry) so I know they took care in making my dish. Overall, I think Amazing Grace is a fantastic gluten-free restaurant in Breckenridge, perfect for breakfast or lunch. Breckenridge Brewery on Main St: Breckenridge Brewery is a bustling bar-style restaurant on Main St. in Breckenridge. The menu items that are gluten-free, or which can be made gluten-free, are clearly marked and there were plenty of gluten-free choices from burgers and salads to large entrees. I ordered the Southwest Chopped Salad (see picture below). It was fair – not my favorite by far – but satisfied my dinner hunger. 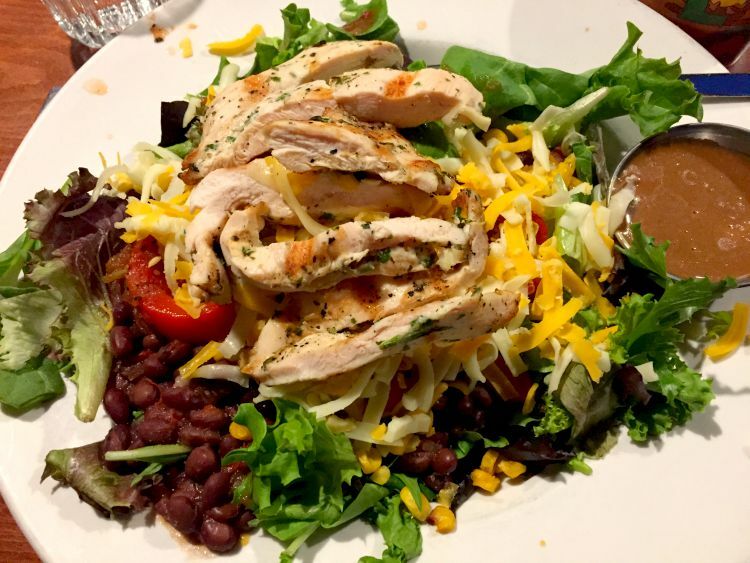 The salad has salsa, beans and roasted red peppers – all which made the salad super soggy and watery. The chef should consider making a few minor adjustments to make this a better salad. If you want to eat gluten-free at Breckenridge Brewery, I recommend sticking with the burger. I hear they are great! The Motherloaded Tavern on Main St: I enjoyed a lovely gluten-free lunch at Motherloaded with my mother-in-law and sister-in-law. The restaurant says it’s “the best and worst of Americana food.” My sister-in-law loved the burger and watermelon gazpacho she ordered, and I, too, enjoyed my naked burger. They were unable to lettuce wrap it, but they served it over a bed of shredded lettuce with a side of sliced pickles and tomatoes (see picture below). The fries and other sides were not safe to eat (made in a shared fryer) so the server substituted two slices of juicy, sweet watermelon as my side. 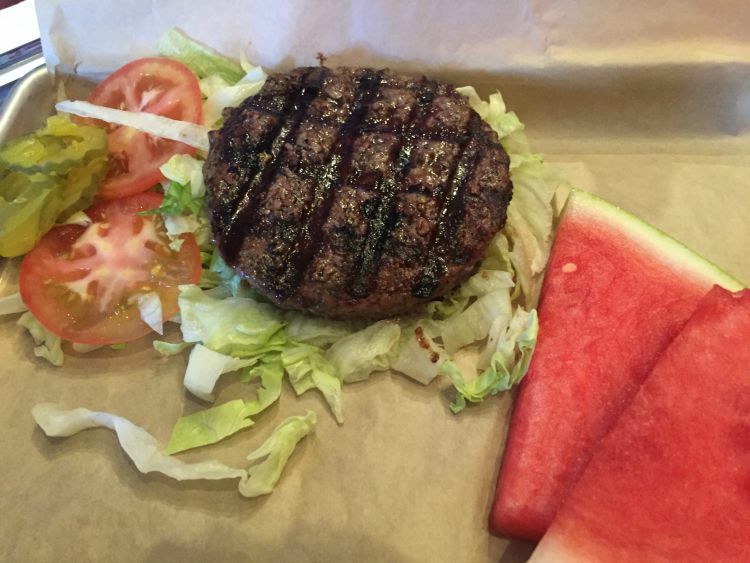 I was fully satisfied with the burger and melon – I highly recommend this gluten-free restaurant in Breckenridge! 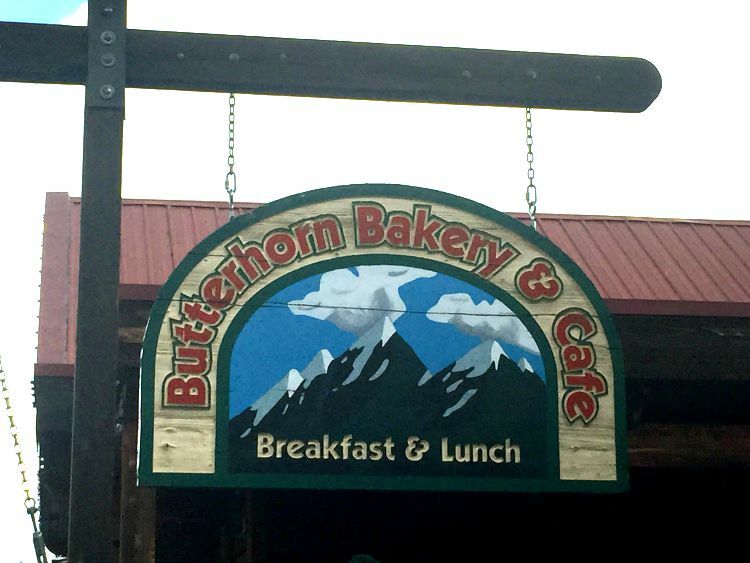 The Butterhorn Bakery on Main Street: I didn’t get a chance to eat here during my latest visit to the area, but I have eaten here in the past and loved it! It’s a charming little restaurant in the heart of “downtown” Frisco. There you’ll find huge gluten-free frittatas and I hear excellent gluten-free french toast (haven’t tried it yet). We tried to go here on Monday and the line was still out the door at 12 noon! You’ll have to wait to eat here – or try to find an off-busy time to visit. It’s a local favorite for breakfast and lunch. Can’t miss! The Uptown on Main (formerly “The Boatyard” American Grill): The Boatyard is a lively place, perfect for lunch or dinner during your stay in the area. The server told us they have the largest menu in the area – and I can confirm that the menu was huge! Salads, pizzas, sandwiches and entrees galore. The server provided me with a huge gluten-free menu with so many options as well. In the past I’ve had a salad with salmon on it (found the portion a little small, so I didn’t order it again). This go round I ordered the gluten-free pizza. The server talked to me two times about how he was nervous about giving someone with celiac disease pizza here, as they cook it in a shared oven, but I asked him to ask the chef to put a paper down under the pizza so it didn’t touch the oven, as well as change gloves and utensils when preparing my pizza. The gluten-free pizza was good (fair – but what do you expect in the mountains?) and I didn’t get sick. They really seem to understand gluten-free at the Boatyard and that’s why this is a must-visit gluten free restaurant in Frisco. Also note that my entire family ordered whatever they wanted (lots of choices) and everyone left full and happy.